Front Row L-R: Beaton Bond Jr., BEATON BOND Sr.1865, Ethel Bond, LENORA MADDOX, holding Mike Bond. 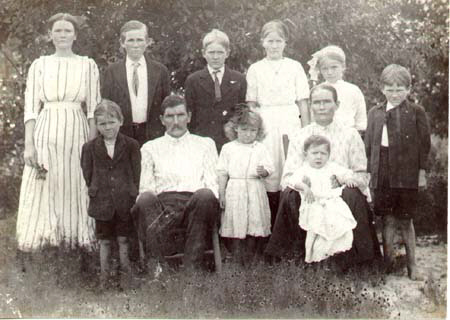 Top Row L-R= Delilia Bond, Lewis Preston Bond 1897, John Bond, Sudie Bond, Maggie Bond, and Seaborn Perry Bond 1905. Thier youngest son Huey Adolphus Bond 1914-1985, was not born yet when this Picture was made. BEATON BOND. son of, CARROL BOND and JULIA TERRELL, was,born, 8 Apr 1865, in Harrison County, MS. and died, 9 Nov 1923, and married, LENORA MADDOX. 1. MARY ELIZABETH BOND. born,19 Aug 1893,married JOHN ARTHUR STOKES. 2. MALATHIA JULIANN BOND. born, 29 Nov 1894, married, EMORY FINNELL. 3. DELILAH BOND. born, 22 Mar 1896, married, JOE DAVIS. 4. LEWIS PRESTON BOND. born, 15 Nov 1897, married, ELLA REED. 5. SUSIE CAUSADIE BOND. born, 20 Mar 1899, married, MARION C MARTIN. 6. JOHN Carrol BOND. born, 3 Feb 1901, married (1st) ADA HINSON, (2nd) VICIE POLLARD WEBB. 7. MAGGIE May BOND. born, 25 1902, married, PRESTON HUGHES. 8. SEABORN PERRY BOND. born, married,(1st)LYDIA STRACENER. (2nd) RELIE GORDON THOMAS, (3rd) BESSIE BASS MADDOX LaCAZE. 9. BEATON ELMER BOND. born, 20 Mar 1907,married, MERTIE STRACENER. 10.ETHEL VINCIE BOND. born,1 Jan 1910,married , JOE HARMON CARRAWAY. 11.MICHAEL Vincent BOND. born, 23 April 1912, married, MAISIE DURAN. 12.HUEY Adolphus BOND. born, 8 May 1914, married, ARLIE LEE BRISTER.